As with anything on the exterior of your home or business, the continual wear and tear experienced through weather and otherwise can have you eventually looking for repair services. Whether you were working on your roof and accidentally stepped into your gutters, or a miscalculated ladder placement has left you with a noticeable dent, you can count on Concord Gutter Installation and Repairs to provide you with the gutter repair services needed to turn back the hands of time on these damages. Possibly the most common of damages to affect your gutters, dents and dings not only mar the appearance of your systems but can also set a foundation for further damages down the road, not only to your gutters but your roof itself. When looking to have a quick and capable repair brought to these lesser forms of damage, you can count on Concord Gutter Installation and Repairs for speed and efficiency. We have been working with gutter materials for years now and know what it takes to provide you with results that bring back visual appeal and efficacy in your gutters. 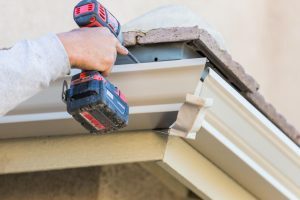 Whether your downspout has suffered damages, or your gutter guards, you can be sure that Concord Gutter Installation and Repairs also has the means to bring you the repairs you’re looking for. We not only pride ourselves on bringing you the results you need when it comes to gutter installation and replacement but aim to have the solutions at hand for any issues you face with these systems. No matter the level of damage or the roof type you have your gutters attached to, you can be sure that our experts have the means to bring you reliable results. Certain levels of damage go beyond standard repair options and need to be considered for replacement in order to bring back the dependability you once counted on them for. When you have sectional gutters installed on your property, this means of replacement can be quick and simple through bringing in a new segment. When calling upon the experts at Concord Gutter Installation and Repairs for these needs, you can depend on getting a perfectly invisible replacement service that matches your gutter material and style in a way that will completely blend in with your current gutter installation. Seamless gutters are built a little differently than sectional offerings and therefore need to be treated differently when it comes to providing proper repairs. Choosing Concord Gutter Installation and Repairs for your needs will ensure that you get the highest level of experience and expertise in your gutter repair services and that you have the means to the most capable and affordable options. No matter the style of gutters in place, no matter the type of building or the style of the roof, you can always count on Concord Gutter Installation and Repairs to provide you with the best possible results in a hurry.